When Nelson Mandela walked out of the Victor Verster prison on 11 February 1960, after 10,053 days of incarceration, people all over the world watched the event with excitement and curiosity - excitement because this foremost symbol of resistance to oppression was free at last, and curiosity as his photographs had been banned by the South African Government for almost thirty years. Mandela was hardly known outside South Africa until he was sentenced to five years in 1962 and then charged in the "Rivonia Trial" in October 1963. But he was a popular leader in South Africa. He was among the first to recognize that the African National Congress could no longer strictly adhere to nonviolence as the apartheid government had closed all avenues for legal or peaceful agitation or resistance. Leaders and activists were subjected to severe restrictions, even confined to home, at the whim of the Minister of Justice. Protest against laws was made a crime punishable with prison and whipping. Mandela went underground with the approval of the ANC leadership, and organized Umkhonto we Sizwe to undertake sabotage, while avoiding civilian casualties, in order to persuade the rulers to change their course. Umkhonto, which included members of all racial origins, appeared in public on 16 December 1961 with a series of acts of sabotage against symbols of apartheid. The "Free Mandela" campaign, launched in the 1970s, caught the imagination of people. A concert on his 70th birthday in 1988, at Wembley stadium in London, was broadcast in many countries and watched by 600 million people. Meanwhile, the South African Government was unable to suppress the revolt in the black townships as the black people had lost fear of prison and assaults. The prospect was an endless conflict, with international sanctions increasingly hurting the white minority. The Mass Democratic Movement emerged as a mighty force with its programme of non-violent dismantling of apartheid laws. Mandela seized the moment to enter into talks with the Government. Leaders of the ruling National Party recognized at last that the security and survival of their people required negotiations with the genuine leaders of the people. The Government lifted bans on the ANC and other organizations and released Nelson Mandela and other leaders. The transition to democracy proved difficult. The ruling National Party tried to retain power by pressing for "group rights" instead of democratic elections. A mysterious "third force" attacked supporters of ANC, while the conflict between Inkatha and the ANC created a grave situation in Natal. A group of Afrikaner generals secretly mobilized 50,000 troops to prevent the ANC from coming to power. Mandela countered with mass demonstrations and continued international pressure on the regime prevented the breakdown of negotiations. On the eve of general elections in April 1964, when the country was threatened with a bloody civil war, Mandela was able to persuade Chief Buthelezi, leader of Inkatha, and General Constance Viljoen, Chief of the Defence Force, to participate in democratic elections. The ANC received 61 per cent of the vote, but Mandela formed a unity government which included the National Party and Chief Buthelezi. General Viljoen, elected to Parliament, became a friend and admirer. In a gesture of unusual generosity, the Government set up the Truth and Reconciliation Commission and enabled those who committed crimes during the apartheid years, including torture and assassination, to obtain amnesty by confessing their crimes. The revolutionary change in the country took place peacefully. There was no violence between whites and blacks, or ethnic groups or political parties. There was no exodus of whites or Indians who received more than their share of seats in Parliament and posts in the Cabinet. 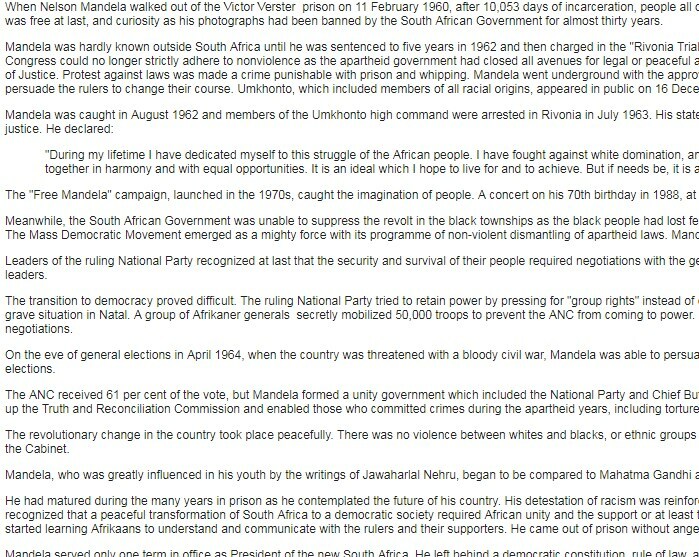 Mandela, who was greatly influenced in his youth by the writings of Jawaharlal Nehru, began to be compared to Mahatma Gandhi and the Reverend Martin Luther King, Jr. He had matured during the many years in prison as he contemplated the future of his country. His detestation of racism was reinforced by the sacrifices of many whites in the struggle for freedom and the support of governments and peoples all over the world. He recognized that a peaceful transformation of South Africa to a democratic society required African unity and the support or at least the acquiescence of the Afrikaners. He befriended militants of all other African organizations who were in Robben Island prison. He started learning Afrikaans to understand and communicate with the rulers and their supporters. He came out of prison without anger, bitterness and hatred. Mandela served only one term in office as President of the new South Africa. He left behind a democratic constitution, rule of law, a free press and a vibrant civil society. Above all, he left for the world a lesson in reconciliation of people of all racial origins, ethnicities and religious affiliations to live together and build their nations. NOTE: E. S. Reddy, former director of the United Nations Centre against Apartheid and recipient of a national award by South Africa, promoted the "Free Mandela" campaign.